E-cigarettes is supposed to be a ‘safer’ alternative to normal tobacco – but the vapour from the devices can contain 10 times as much cancer-causing poison as normal tobacco, a new study has found. Researchers at the National Institute of Public Health, Japan, found high levels of dangerous carcinogens such as formaldehyde and acetaldehyde in several brands of e-cigarette liquid. The levels detected were much higher than those in normal tobacco. ‘In one brand of e-cigarette the team found more than 10 times the level of carcinogens contained in one regular cigarette,’ said Dr Naoki Kunugita, of the National Institute of Public Health. Normal tobacco contains a huge number of toxins, so the new research does not prove that cigarettes are ‘safer’ – just that e-cigarettes may be riskier than thought. The researchers believe that the carcinogens are released when the element which vapourises the liquid inside the e-cigarette overheats. Unlike normal cigarettes which burn dried tobacco, e-cigarettes use a battery-powered device to heat a nicotine solution known as e-liquid. This produces an aerosol that can be inhaled (vaping). 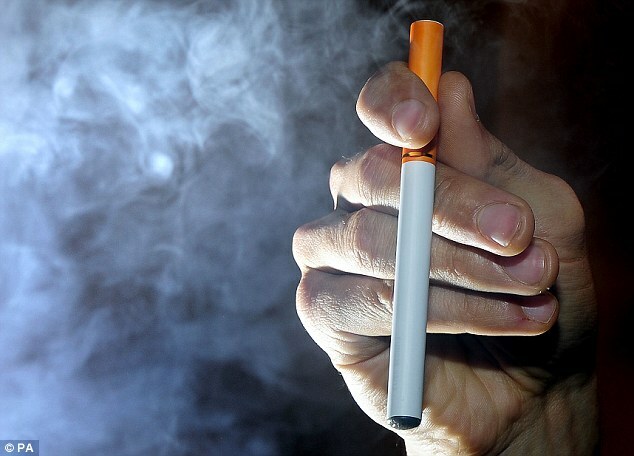 Higher end e-cigarettes allow the heat temperature to be adjusted, which can intensify the nicotine hit. Previous research by Roswell Park Cancer Institute in Buffalo, NY, suggests the way particles are broken down in e-cigarettes may irritate lung tissue and cause disease. Particles in tobacco-based cigarettes have a median size of 0.3 to 0.5 microns, but in e-cigarettes they are a lot smaller at 0.18 to 0.27 microns. This means particles can travel deep within the lungs and embed themselves in the alveoli, the tiny air sacs in the lungs where the exchange of oxygen and carbon dioxide takes place, causing damage.